Make the most out of your swimming pool by extending its use throughout the year, not only during the summer months! This will be possible if you invest in the best pool heater, which will help to maintain the right temperature of the water so that you can swim even when the weather is chilly. Even when it is the cold season, you can still use the pool and swim in comfort. Looking for a pool heater, however, is not as straightforward as it seems. What type of pool do you have? How large is it? What is your preferred source of power? How much is your budget? These are just some of the questions that every buyer must ask. If you need help picking the right product, read on and learn from the valuable insights we will be sharing. When it comes to pool heaters, there is perhaps no other brand that is as popular as Hayward, which makes this product one of the top options worth considering. This is their most popular heater, making it our favorite as well. Looking at its features, one thing that makes this an exceptional product is the polymer header, which is a patented innovation. The latter improves it hydraulic performance while also being instrumental in terms of energy efficiency. Meanwhile, with the Cupro Nickel Heat Exchanger, you can expect that it will be long-lasting, even when you use it in saltwater pools. The chemistry of the water will not negatively affect such component. It also has the forced draft combustion system. This allows the air to be constantly moving in the system for the continuous supply of heat to the water regardless of the external weather condition. In terms of being user-friendly, this is nothing short of impressive. One thing that makes this possible is the LED digital control panel that makes it easy to input the desired commands. It also shows the diagnostics or error message, making it easy to determine what is wrong and how to troubleshoot the problem. If you are looking for a cheap and eco-friendly alternative to heat your swimming pool, this is one product that you should consider buying. Because it harnesses the power of the sun, there is no need to waste money on your electricity bills. Plus, it utilizes the energy of the sun, so you are basically doing something good for the environment. This solar heater has dimensions of 4 x 20 feet, which will make it capable of raising the temperature of the pool’s water by as much as 4 to 10 degrees Fahrenheit. It is also worth noting that it is a universal system, which means that you can use it whether you have an inground or above ground swimming pool. When you closely examine the construction of the solar panels, you will be convinced that it is indeed a great option. For instance, there are vents that will allow it to withstand even windy conditions. The design is also optimized to harness the maximum energy of the sun and to prevent the water from saturating the panels. The solar panel itself is made of polypropylene, a material that is known for its durability. This model uses the innovative flow sensor technology, which makes it possible to heat the water in your swimming pool. This is a significant improvement compared to more conventional models that use traditional pressure switch activation. This technology reduces the possibility that there will be burned components of the heater. With the digital thermostat that comes with the unit, having it controlled will be almost effortless on your end. You can easily input the temperature that is desired. There is a digital display that will allow you to monitor the current temperature. The temperature, meanwhile, can be set from 80 to 140 degrees Fahrenheit at an increment of one degree. Based on the technical specifications from the manufacturer, this model will be able to heat up a pool with up to 15,000 gallons of water. Nonetheless, it should be noted that the unit is not waterproof, which is why it requires an indoor installation. Exposure to rain and other external elements can cause rusting and will significantly shorten its functional life. Lastly, the manufacturer offers a two-year warranty from the date of its registration. As Hayward is a popular brand of a pool heater, it deserves another spot on our list. This electric pool heat pump is a high-performance product that can provide an assurance that your water will stay hot while you swim. The overall construction of the unit is reflective of its top-notch quality. It has an Ultra Gold evaporator coil, which is known for its ability to resist corrosion. It also comes with a Titanium Heat Exchanger, which will be great in terms of avoiding wear and tear that can be caused by chemicals and saltwater. It has stainless steel hardware and a UV-resistant panel, providing an assurance that it will not be easily prone to deterioration. If you have had a pool heater that operates with too much noise, this will be different. The manufacturer takes pride in the fact that it offers ultra-quiet operation. This can be attributed to the acoustic compressor cover that minimizes noise and the profiled fan blade. Lastly, it is capable of producing up to 140,000 BTU of heat, which is one of the reasons why the price could be quite steep for some buyers. With this, it can effortlessly heat up pools with up to 50,000 gallons of water. This 250,000 BTU heater will heat up the water quickly, so there is no need to wait for a long time before you can take a plunge. The manufacturer boasts that this unit has the best-in-class heating efficiency. It comes with a fully-mixed system for reliability. Another notable feature of this product is the hot surface ignition. The latter is the one that is responsible for being user-friendly, eliminating the need for calibration and complicated setup. There is also a rotating digital display that simplifies setup and monitoring. There is also electronic ignition. This will also be an excellent choice if you are looking for space-efficiency. It has a compact body, but this does not mean that the power is compromised. Because of its size, it will not be obtrusive. It has enhanced diagnostic capabilities. When there is a problem, there is no need to immediately consult with a technician. You can perform the diagnosis on your own. It is also low-NOx certified, which will make it a great option if you are after a product that is eco-friendly. It should be noted that pool heaters come in different types. They can be categorized based on their source of power and how they heat up the pool. With this, here are the options that you will be confronted with. As the name implies, they run using an electrical connection. They are also called tankless heaters and they are known for their low initial cost. However, one problem is that most of them are designed only for small pools because of their limited heating capacity. They also run through an electric connection. However, it is different from the heater above in the way it heats water. Heat will be extracted from the outside air and it will be pumped to increase the temperature of the water in the pool. If you are looking for a cost-efficient way to heat the pool, this should be your top pick. It is also eco-friendly, basically because it utilizes the power of the sun to heat the pool. The initial cost can be steep, but the long-term savings can convince you to choose it over other types of pool heaters. Gas pool heaters can prove to be efficient when they are used for a short period. However, with the rising gas prices these days, it is no longer as popular. The heating chamber burns the gas and the energy it produces heats up the water in the pool. Budget: Start with how much you can spend before you head out to shop. Nonetheless, take note that cheaper products may demonstrate inferior quality. Consider the heater as an investment. Pool Type: Do you have an inground or above ground pool? This is important to make sure that the heater will work for your needs. Heat-up Time: No one has the patience to wait for a long time before the pool heats up. The heater should be powerful enough to reach the desired temperature in no time. Warranty: The warranty will provide you with peace of mind, knowing that the manufacturer can provide free repair and replacement of damaged parts depending on the terms and conditions that have been specified. 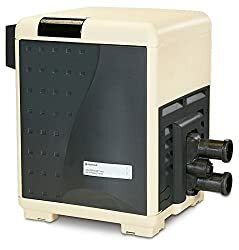 Aside from the factors that have been mentioned above, the size of the pool is one more thing that will be instrumental in deciding which heater should be purchased. Obviously, if you have a large pool, you will need a more powerful heater. Look at the power of the heater, which is often measured in BTU and make sure that it matches the size of your pool. Generally speaking, if the pool is up to 200 square feet, which approximately has 1,000 to 5,000 gallons of water, 100,000 to 200,000 BTU will be enough. If the pool is larger than the maximum heating capacity of the heater, the latter will be nothing but a waste of money. Regular inspection of the heater is a must. This will make it easy to determine a problem before it becomes worse. This will also prevent costly repairs in the near future. You have to religiously follow the instructions from the manufacturer. Ask for a help from a professional for its proper installation. Pay attention to leaks, especially if the unit is powered by gas. In the case of the latter, install it in a place that is away from fire hazards. Gas pool heaters can also produce carbon monoxide emissions. This will be bad for your health and the environment. It is important to provide proper ventilation to prevent carbon monoxide poisoning. Choose a unit that comes with an abundance of safety features, such as the ability to automatically turn off once it overheats or the components have been damaged. Protect the pool heater from external factors that could speed up wear and compromise its safety. Choose a proper location for its installation depending on what the manufacturer recommends. From all of the heaters that are mentioned in this post, the Hayward H400FDN stands out above all others. It has a superior construction that allows the heater to demonstrate longevity regardless of the chemistry of water. It also offers a user-friendly interface and a reliable heating capability regardless of the weather conditions. With the right choice for a pool heater, you can swim in peace and comfort, even if the temperature is already low. Heated water in the pool will make swimming more fun! Keep an eye on the products mentioned in this post to enjoy the best bang for the buck!